FREE airport service: Booking one of our vacation apartments in Rio de Janeiro with a minimum 14 days staying, we are pleased to offer you free car service from Rio de janeiro airport to our company Copacabana Holiday. In order to guarantee maximum comfort and security for all our clients, we can provide a sophisticated Rio airport car service, using air-conditioned minibuses or cars through Radio-Taxi Coopertramo. They can be waiting for you at Rio de Janeiro International airport -- all you need to do is to make a booking. 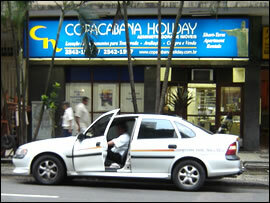 The same air-conditioned minibuses or cars are also available for private tours in Rio de janeiro. Your airport car service chauffeur will be waiting for you at the arrivals gate. He will be holding a placard bearing your name so that he can be easily located. This chauffeur will take you directly to our company offices of Copacabana Holiday, from where you will be taken by one of our employees to the apartment you have booked. The fee for the airport car service varies in accordance with the number of passengers to be transported. This information should be notified to our company in advance.